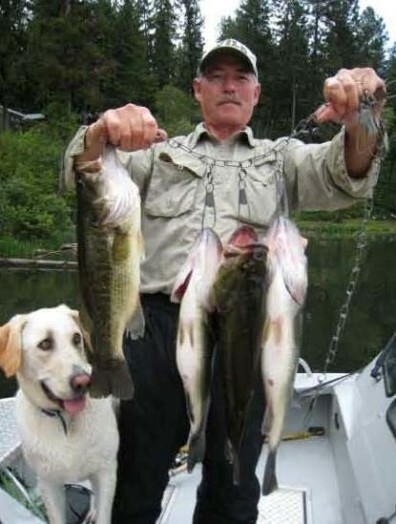 Anthropology | William Andrefsky, Jr.
Prehistoric hunter-gatherer organization, lithic technology, rise of sedentism, and information transmission. I am interested in methodological approaches to archaeology that primarily deal with stone tools and lithic debitage analysis. This may seem trivial to some, however, a case can be made that a great majority of the materials found on prehistoric sites from all parts of the world are composed of stone, yet we know so little about how to interpret such materials. The archaeological record is a collection of the material remains of past human activities and behaviors. Because of organic decomposition, natural erosion, and modern landscape development only a very small fraction of that material culture is preserved on prehistoric site locations. Stone tools, however, are among the few kinds of material culture withstanding the inroads of natural and cultural perturbations. I think it is fascinating and essential to develop techniques and methods that will help us determine how to interpret behavioral and cultural information from this body of data. 2015 Lithic Technological Systems: Stone, Human Behavior, Evolution. Cambridge University Press, Cambridge, UK. 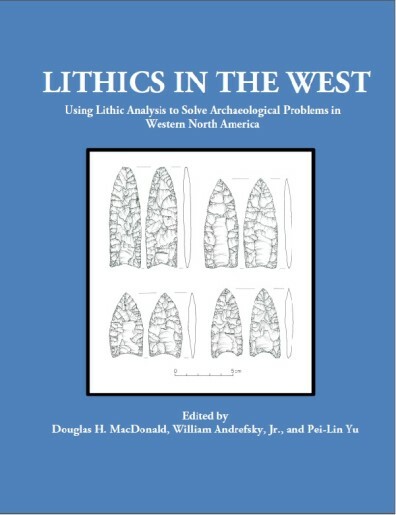 edited by Nathan Goodale, William Andrefsky, Jr.
2014 Lithics in the West. University of Montana Press, Missoula. Edited by Douglas MacDonald, William Andrefsky, Jr. and Pei-Lin Yu. 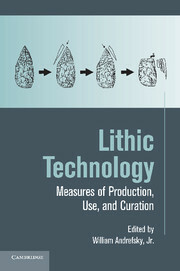 2008 Lithic Technology: Measures of Production, Use and Curation. Cambridge University Press, Cambridge, UK. 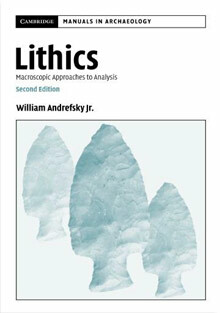 edited by William Andrefsky, Jr.
2005 Lithics: Macroscopic Approaches to Analysis, Second Edition, Cambridge University Press,Cambridge, U.K., by Andrefsky, Jr., William. 2001 Lithic Debitage Analysis: Context Form Meaning.University of Utah Press, Salt Lake City. edited by William Andrefsky, Jr.
2013 Fingerprinting Flake Production and Damage Processes: Toward Identifying Human Artifact Characteristics. In Paleoamerican Odyssey. Edited by Kelly Graf, Michael Waters, and Ted Geobel, pp. 415-428. Texas A&M Press, College Station. 2013 Williams, Justin P., Andrew Duff, and William Andrefsky, Jr.
Debitage Stylistic Variability at Cox Ranch Pueblo. 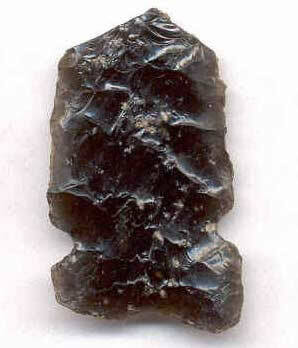 Lithic Technology 38:3-16. 2012 Andrefsky, Jr., William Raising the Bar: Lithic Analysis and Archaeological Research in the Southeast. In Contemporary Lithic Analysis in the Southeastern: Problems, Solutions and Interpretations, edited by Phil J. Carr, Andrew P. Bradbury, and Sarah E. Price, pp. 182-193, University of Alabama Press. 2011 Ferris, Jennifer M., and William Andrefsky, Jr. Transport Damage and Lithic Analysis: New Insights. In Archaeological Papers from the New Ground Australian Conference, Edited by Benjamin Marwick and Alexander McKay, pp. British Archaeological Reports, Oxford, UK. 2011 Williams, Justin, William Andrefsky Jr., Debitage Variability Among Multiple Flint Knappers. Journal of Archaeological Science. 38:865-872. 2010 Andrefsky, Jr., William Human Land-use Strategies and Projectile Point Damage, Resharpening, and Discard Patterns, Human Evolution 25:13-30. 2010 Goodale, Nathan, Heather Otis, William Andrefsky, Jr., Ian Kuijt, Bill Finlayson, Ken Bart Sickle Blake Life-History and the Transition to Agriculture: An Early Neolithic Case Study from Southwest Asia. Journal of Archaeological Science 32:1192-1201. 2009 Andrefsky, Jr., William The Analysis of Stone Tool Procurement, Production, and Maintenance. Journal of Archaeological Research 17:65-103. 2009 Terry, Karisa, William Andrefsky, Jr., Mikhail V. Konstantinov Raw Material Durability, Function, and Retouch in the Upper Paleolithic of the Transbikal Region, Siberia, In Lithic Materials and Paleolithic Societies, edited by Brian Adams and Brooke Blades, pp. 256-259. Wiley-Blackwell, West Sussex, UK. 2008 Wilson, Jennifer Keeling, and William Andrefsky, Jr. Unpacking Production, Resharpening and Hammer Type, in Lithic Technology: Measures of Production, Use and Curation , edited by William Andrefsky, Jr., pp. 86-105. Cambridge University Press, Cambridge. 2007 Andrefsky, Jr., William Cobble Tool or Cobble Core: Exploring Alternative Typologies. In Tools or Cores: Alternative Approaches to Stone Tool Analysis, edited by S. B. McPherron, pp 253-266. Cambridge Scholars Publishing, UK. 2007 Andrefsky, Jr., William The Application and Misapplication of Mass Analysis in Lithic Debitage Studies. Journal of Archaeological Science 34:392-402. 2006 Andrefsky, Jr., William Experimental and Archaeological Verification of an Index of Retouch for Hafted Bifaces. American Antiquity 71:743-758. 2005 Andrefsky, Jr., William Lithic Studies. In Handbook of Methods in Archaeology, edited by H.D.G. Maschner and C. Chippindale, pp. 713-770. AltaMira Press, Walnut Creek, CA. 2004 Andrefsky, Jr., William Partitioning the Aggregate: Mass Analysis and Debitage Assemblages. In Aggregate Analysis in Chipped Stone Studies, edited by Mary Lou Larson and Christopher Hall, pp 172-193, University of Utah Press. 2004 Andrefsky, Jr., William Materials and Contexts for a Culture History of the Columbia Plateau. In Complex Hunter-Gatherers: Evolution and Organization of Prehistoric Communities on the Plateau of Northwestern North America. Edited by Wm. C. Prentiss and Ian Kuijt, pp. 35-62, University of Utah Press, Salt Lake City. 2001 Lithic Debitage Analysis: Context Form Meaning. University of Utah Press, Salt Lake City. edited by William Andrefsky, Jr.
2001 Rasic, Jeff, and William Andrefsky, Jr. Blade Cores and Technological Organization in Northwestern North America. In Lithic Debitage Analysis: Context Form Meaning. edited by William Andrefsky, Jr., pp. 233-258, University of Utah Press, Salt Lake City. 2000 The Calispell Archaeological Project: Final Report, Volumes 1-V. Center for Northwest Anthropology, Project Report Number 16. edited by William Andrefsky, Jr., Gregg Burtchard, Kira Presler, Steven R. Samuels, Paul H. Sanders, and Alston ThomsWashington State University, Pullman, Washington. 1997 Andrefsky, Jr., William Thoughts on Stone Tool Shape and Inferred Function. Journal of Middle Atlantic Archaeology 13:125-143. 1994 Andrefsky, Jr., William Raw Material Availability and the Organization of Technology. American Antiquity 59:21 35. 1994 Andrefsky, Jr., William The Geological Occurrence of Lithic Material and Stone Tool Production Strategies. Geoarchaeology: An International Journal 9:345-362. 1991 Andrefsky, Jr., William Inferring Trends in Prehistoric Settlement Behavior Lithic Production Technology in the Southern Plains. North American Archaeololgy 12(2) 129-144. 1990 An Introduction to the Archaeology of Pinon Canyon, Southeastern Colorado Vols. I VI. National Park Service, Rocky Mountain Region, Denver, Colorado. 1987 Diffusion and Innovation from the Perspective of Wedge Shaped Cores in Alaska and Japan. In The Organization of Core Technology. eds. Johnson, J.K. and C.A. Morrow. Westview Press, Boulder, Colorado. 1982 Reduction Sequences and the Exchange of Obsidian in Neolithic Calabria. In Contexts for Prehistoric Exchange. eds. Ericson, J. and T. Earle, pp. 149-172. Academic Press, New York. (second author with Albert Ammerman).